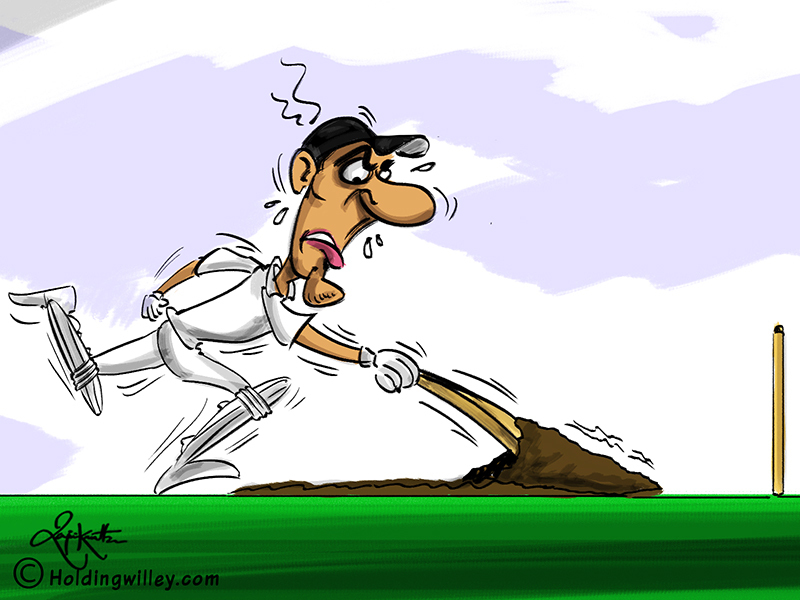 India made a mess of a very gettable 194 against England in the 1st Test at Edgbaston. While the target certainly wasn’t a cakewalk, as the ball swung throughout the Test, India made a meal of it and missed a golden opportunity to take a 1-0 lead in the 5-Test series and gain the psychological advantage. However, it must be said that chasing in the 4th innings is always a difficult proposition in Tests. The sheer enormity of the task, a deteriorating pitch and knowing that the team won’t get another chance to influence the outcome of the Test is enough to give most teams the collywobbles. In August 1882, Australia successfully defended a lead of 84 against England at the Oval. But in those days the pitches were of dubious quality and that would certainly be part of the reason for England failing to chase down the target. In March 2000, Zimbabwe were set a target of 99 by the West Indies and scored just 63 to lose by 35 runs at Port of Spain. So. What exactly is a challenging total in the 4th innings? Let us assume that any total under 150 is gettable, irrespective of the nature of the pitch, and that the side chasing in the 4th innings start as firm favourites. Also, we will consider totals between 150 and 200 as tricky, where the fielding side is certainly in the hunt if they bowl and field well and take all their chances. Moreover, we will consider only Tests with a decisive result in this analysis and ignore Tests which ended in a draw. When a team has chased a target between 101 and 150 in Tests, they have won on 115 occasions and lost just 17. Of the 119 occasions in which a team has chased a target between 151 and 200 which have ended in a decisive result, the chasing team has won on 91 occasions and lost on just 28 occasions. This translates to 76.47%. For Tests played in the new millennium, with the same target between 151 to 200, the team chasing in the 4th innings has won on 44 occasions and lost 8 times, which is 84.61%. This shows that even in the era where the pitches are better and scoring rates are much higher than in the early days of Test cricket, a target between 151 and 200 always gives the fielding team a chance if they bowl well and take every chance that comes their way. Here are 3 occasions where the team chasing failed to make it over the line. Sri Lanka vs South Africa, Asgiriya Stadium, Kandy, 30th July-2nd August 2000. Result: South Africa won by 7 runs. Normally, electing to bat after winning the toss in the sub-continent is a no-brainer; especially in Sri Lanka where most pitches are dry turners. However, in this match it rained incessantly for a couple of days and Sanath Jayasuriya put South Africa in to bat after winning the toss. The Proteas were reeling at 34/5 before Lance Klusener and Mark Boucher counterattacked and took South Africa to 253 all out. In reply, Sri Lanka scored 308 to take a first innings lead of 55, with Marvan Atapattu scoring a magnificent 120. In South Africa’s 2nd innings Jacques Kallis came to the party with 87 as the Proteas set the hosts a target of 177. South Africa needed to strike early to stay in the match. Shaun Pollock and Nantie Hayward had the Lankans reeling at 0/2. Both Atapattu and Jayasuriya were ruled LBW to Pollock and Hayward respectively without opening their account. That soon became 21/4 before Russell Arnold and Arjuna Ranatunga put on a century partnership for the 5th wicket to take Sri Lanka to within 47 runs of victory. Arnold was LBW to Boje while Jonty Rhodes took a brilliant reflex catch at short leg to dismiss Ranatunga off Boje again. Sri Lanka needed just 16 to win with 3 wickets in hand when Klusener yorked Upul Chandana. Chaminda Vaas was run out with just 8 runs needed and Muttiah Muralitharan was wrongly adjudged caught behind for South Africa to complete a memorable victory by just 7 runs. Arjuna Ranatunga and Lance Klusener were declared the joint Men of the Match. Ricky Ponting chose to bat on a green pitch and Australia were bowled out for 127, with Mohammad Asif taking 6 wickets. Pakistan replied strongly with a lot of batsmen making contributions to post 333. With a lead of 206, Pakistan were in pole position at the end of the 1st innings. In Australia’s 2nd innings, Shane Watson scored a valiant 97 and Mike Hussey stood firm as Australia were reduced to 257/8. At this stage, they were in a precarious position as they had only 2 wickets left with a lead of just 51. However, Peter Siddle gave Hussey valuable support and the pair put on 123 for the 9th wicket. Siddle’s contribution was 38 off 117 balls and Mike Hussey scored a magnificent unbeaten 134 before Siddle was caught by Misbah-ul-Haq off Mohammad Asif. Pakistan were set a target of 176 to win the Test and level the series at 1 apiece. The SCG is known to assist spinners and Nathan Hauritz wove his magic. Umar Akmal scored 49 before he was caught by Mitchell Johnson off Doug Bollinger. At one stage, Pakistan were 133/6 and the match was in the balance but Akmal failed to see Pakistan through. Hauritz mopped up the tail as Australia won by 36 runs and Mike Hussey was adjudged the Man of the Match. Later on, there were some doubts regarding whether the match had been fixed, but that should not detract from the amazing comeback that Australia pulled off. India batted first but imploded from 174/5 to be dismissed for 189. Nathan Lyon took a career best 8/50 on a pitch were there was appreciable turn and very low & variable bounce. In reply, Australia pressed home their advantage as Matthew Renshaw and Shaun Marsh scored fifties, taking Australia to an 87-run lead. In India’s 2nd innings, KL Rahul followed his first innings 90 with a steady 51 and was given valuable support by Cheteshwar Pujara, who made 92. At one stage India were 120/4 and just 33 runs in front. Ajinkya Rahane’s partnership with Pujara put on 118 runs for the 5th wicket before there was a collapse and India were bowled out for 274. Australia needed 188 to win and take an unassailable 2-0 lead in the 4-Test series. In spite of being a formidable team, Australia has a reputation of being very vulnerable when chasing low totals. Ishant Sharma set the ball rolling by sending back Renshaw caught behind by Wriddhiman Saha for 5. As always, Steven Smith’s wicket was key to the outcome of the match. He was plumb LBW to a delivery from Umesh Yadav that barely rose of the ground and led to the infamous DRS controversy. Ravichandran Ashwin put the issue beyond doubt by dismissing Mitchell Marsh and Matthew Wade as Australia capitulated and were bowled out for 112. Ashwin took 6/41 as India won by 75 runs to level the series 1-1. KL Rahul was declared the Man of the Match.